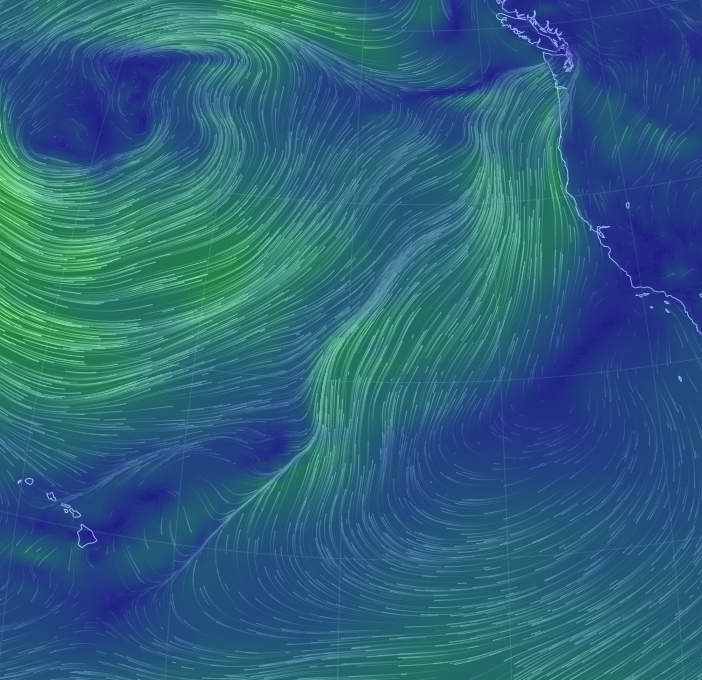 I am providing commented routing results for a Cal40 and a Santa Cruz 50 here: Routing for the Pacific Cup 2014. You also find the link in the left column (look for the "New" label). You can of course always do it on your own by going to Easy Routing. In preparation for this year's Pacific Cup race, Cirrugator defaults for this race for more convenience in routing. Like before, for the most easy routing simply go to the Cirrugator Easy Routing site, select a boat and press the Go button. Or for even easier routing download CirrugatorDroid as an app for your Android based smartphone/tablet (internet connection required). 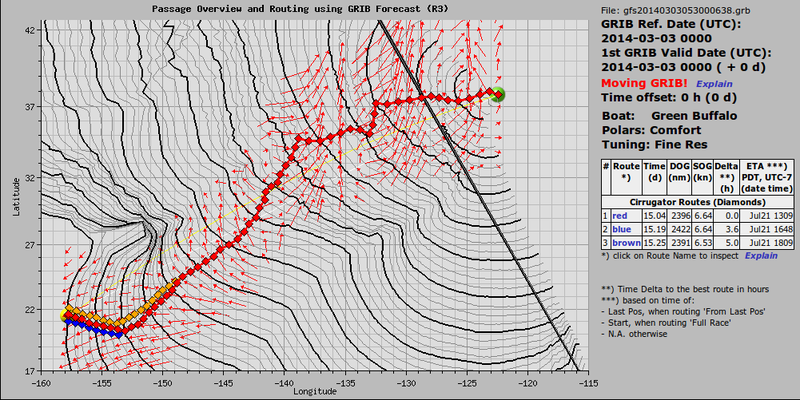 You can get the routing optimzed for your boat by sending me your boat's polars. If you have any questions or suggestions, please contact me! 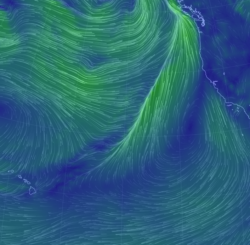 The current global wind map gives a wonderful impression of the wind pattern on small to large scale. Use your mouse to see other areas and change the scale. 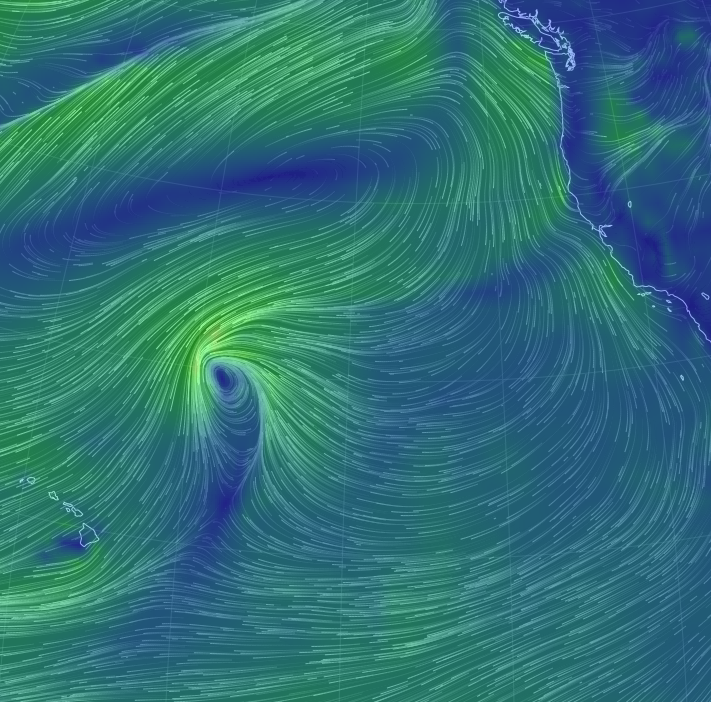 I took a screenshot today (March 3, 2014), showing quite an unpleasant picture for sailing from CA to HI. I also started a routing for a Cal40 sailing the PCup route. It estimated a not-so-bad time of 15 days. However, please note that the rounting is NOT just based on today's weather pattern! 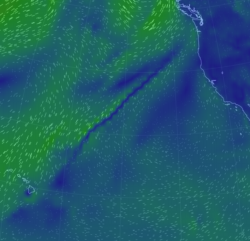 Instead, the router uses the wind projections for the next 10 days, and determines the route which gets you to Hawaii the fastest, taking into account the changing winds over the whole route! Even if you could also plot the wind pattern for the next 10 days, and put it up in a stack, it does not seem to be possibel for a human mind to find the best path in this kind of three-dimensional wind stack. But the computer can. In preparation for this year's Transpac race , Cirrugator defaults for this race for more convenience in routing. For the most easy routing simply go to the Cirrugator Easy Routing site, select a boat and press the Go button. In addition I am providing commented routing results for a Cal40 here: Cirrugator Routings for the Transpac 2013. This years's Pacific Cup has started today. I am providing commented routing results here: Cirrugator Routings for the Pacific Cup 2012. Remember that you can still do the routing for yourself by going to the Cirrugator Easy Routing site, select a boat and press the Go button. In preparation for this years's Pacific Cup, the router build into Cirrugator has been made available as a simplified, stand-alone version as Cirrugator Easy routing. Hopefully it will contribute to understanding how to find the 'magic' route. Try it out! 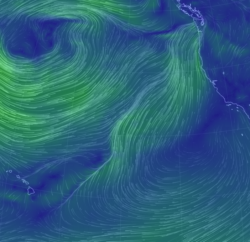 The new blogsite for this year's Pacific Cup is up at cirrus2010.blogspot.com, joins us there! 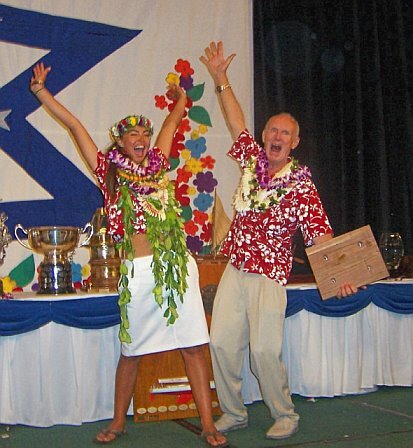 The new blogsite for this year's Pacific Cup is up at cirrus2008.blogspot.com, joins us there! Cirrugator has found a new home on its own website www.cirrugator.com, and on a new server, which gives the performance that was sometimes missing on the previous installation. [Captain] Austin said at the dock, "We kind of came into this as an underdog. 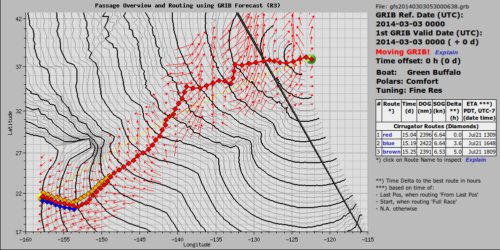 Ulli [Ulli Steiner, Myers' fellow nuclear physicist in Germany and longtime friend] wrote a weather tracking program [i.e. Cirrugator] for us. A couple of days into the race the program said to go south for 2 1/2 days. I didn't think that was the thing to do and we talked about it for a full day. Finally, I decided to go south as the program said, but for only 1 1/2 days. We weren't sure if that was the right thing to do but... Oh! Let me tell you how we found out it was the right move! You can replay the race with Cirrugator all by yourself. All data are available online; look for the links to Cirrugator in the left panel. Congratulation to the crew. Did they enjoy the victory? - I think the picture tells it all. Look for more info in the blog.